By Troy Jackson. Lexington: University Press of Kentucky, October 2008. Cloth: ISBN 978-0813125206, $35.00. 248 pages. 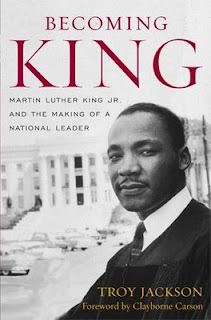 Troy Jackson’s new book Becoming King explores the various influences that impacted Martin Luther King Jr. during his development as a civil rights leader. Jackson, a pastor and historian, has built upon his experiences working with the King Papers at Stanford to take a closer a look at King’s sermons and essays in exploring King’s intellectual development. Jackson argues that the people of Montgomery, such as E.D. Nixon and Jo Ann Robinson, played a larger role in King’s development than more prominent social activist intellectuals, such as Reinhold Niebur and Mahatma Gandhi, who are most often credited with influencing King’s philosophies. The author further contends that King provided spiritual leadership for the Montgomery Bus Boycott, but that his oratory power contributed to his inability to sustain a mass movement in Montgomery after the bus boycott ended. Jackson maintains that “the bus boycott did more for King and the emerging national civil rights movement than it did for the broader African American community in Montgomery” (7), and that these implications can teach us more about the strengths and weaknesses of King’s civil rights leadership. Becoming King aptly opens with a discussion of Montgomery activism prior to King’s arrival in the city often referred to as the Cradle of the Confederacy. Jackson shows that African American civil rights organizations had been active in the city as early as 1888. Jackson’s discussion of pre-King activism in Montgomery is comprehensive and includes numerous organizations and individuals who laid the foundation for a mass movement during the years prior to the boycott, but who also had trouble activating the black community. Jackson appropriately credits E.D. Nixon, Rosa Parks, Jo Ann Robinson, and Vernon Johns for laying the groundwork required for later activism. The next section of the book delves into King’s background. Jackson notes early influences on King before showing the impact that Morehouse President Benjamin Mays had on the young college student. Mays, according to Jackson, first introduced King to Gandhian philosophies after meeting Gandhi in 1948. Jackson’s narrative then tracks King to Montgomery while neglecting King’s experiences in graduate school at Crozer Theological Seminary and Boston University on the way. The remainder of the book focuses on King in Montgomery and how the city’s established black leadership propelled King into national prominence. Jackson uses King’s sermons in the late 1950s to illuminate the intricacies of his burgeoning civil rights leadership in Montgomery before concluding with a brief discussion of King’s post-boycott activism, which was focused on the national level, thus hindering the potential of local activism. Jackson’s argument about the influence of Montgomery’s black leaders on King is compelling, but he loses momentum by dismissing the importance of King’s experiences in graduate school. King’s experiences at Crozer are summed up in a single paragraph, while his development in Boston is discussed in two pages. Jackson argues that “King’s time at Crozer was a season of development and growth rather than one of activism” (46). It is curious that Jackson does not further explore this development. Furthermore, looking solely at Crozer limits the potential impact that living in Chester, Pennsylvania had on King. Chester is one of the oldest bastions of racial justice advocacy in the United States. Its residents played important roles in the abolition movement through the civil rights movement, and King’s immersion into this community must have had some sort of impact on him. Taylor Branch has discussed King’s experiences at Crozer in greater detail, and Jackson would have been wise to reciprocate or at least explore possible influences. The same can be said for King’s experiences in Boston. Jackson also underplays the importance of Vernon Johns. The two men had a relationship, and Johns impacted King’s development in a number of different ways. If nothing else, Johns provided an important foundation at Dexter for civil rights activism. By 1954, much of the congregation at Dexter Avenue Baptist Church expected political activity from the pulpit. Furthermore, Johns’s radicalism opened a space for King to be seen as moderate even if he was involved in civil rights activities. The most intriguing part of Jackson’s book is his discussion on class in Montgomery. Jackson poignantly observes that Dexter Avenue Baptist Church, where many boycott activities were organized, was a middle-class black church, while First Avenue Baptist Church, where Ralph Abernathy preached, was more working-class. This dynamic was important to the boycott, as most of the people who quit riding the bus were working-class people who probably did not attend Dexter. Jackson, however, does not fully explore the issues of class that surround the boycott, but this is an important observation. Ultimately, Becoming King is an interesting read filled with several new layers of information. The book benefits heavily from Jackson’s work at the King Papers project in Stanford. Jackson effectively uses King’s words to provide a boycott narrative that illuminates several aspects of the famous civil rights leader’s ideological development and how King was able to inspire the working class of Montgomery to sacrifice their only means of transportation. This book could have benefitted from a further discussion of King’s influences prior to Montgomery, but it is an intriguing look into the development of the civil rights movement’s most visible figure.